Last lesson we discussed the ways we are allowed to stop on words that end with a (pronoun). We explained that there are three different schools of thought on whether we can stop with or , and discussed the first two schools of thought. This lesson we discuss the third school of thought. As an overview, we will briefly review the other two schools of thought. The pronoun which is at the end of words such as in: or or can be stopped with an absolute sukoon, and all are agreement with this. There is a difference of opinion as to whether it can be stopped with or . There are three schools of thought concerning this. A. The first school of thought: Complete forbiddance of stopping with or on the . B. The second school of thought: Allowance of and when stopping depending on the vowel of the when continuing. C. The third school of thought: . It is divided into sections, and according to Imam Al-Jazaree it is the most correct school of thought. There is forbiddance of and in four states, and allowance of them in all other states. 1) When a saakinah occurs before a pronoun , no matter if it is a lengthened or of a leen . 2) When a saakinah occurs before the , with no difference being made to whether it is a lengthened saakinah as in: , or saakinah of a leen, as in: . 3) When a kasrah precedes it . 4) When a dhammah precedes it . 1) When a lengthened alif occurs before the . 2) When a fat-hah precedes it. 3) When a true sukoon precedes it. 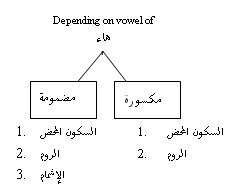 It is to be noted that the is never conjugated, and is fixed in vowel either with a dhammah or a kasrah. The can be stopped on with and in the three previously discussed allowable states, according to its vowel when continuing. If it has a dhammah, then it can be stopped on with a complete sukoon, or with , or with . If it has a kasrah it is only allowed to stop on it with or with a complete sukoon ( ). The following chart summarizes the three schools of thought on stopping with words ending with the pronoun .